Can this be frozen for later? This looks great! You mention cinnamon rolls though and I am unable to find that recipe on your blog. Am I looking in the wrong place? Thank you so much for this recipe. 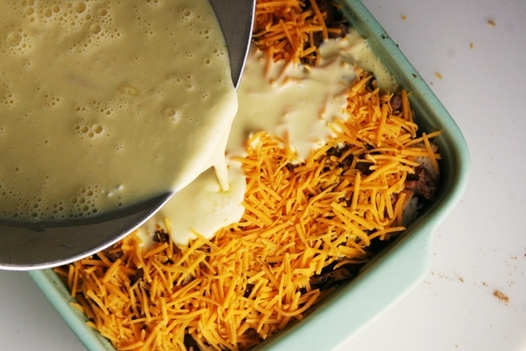 It is seriously one of the best casserole dishes on earth! My friends and family just couldn’t stop eating it this morning. We had to all take a very long nap afterwards from our casserole comas! : ) Will definitely be making this over the holidays for many years to come. I made this for my family Christmas morning but didn’t plan ahead. I pulled it all together and let it sit for 15 minutes and it was GREAT! My family loved it! I used seasoned tator tots and substituted milk for the cream. I will definately make again. This looks wonderful! I’m finally getting back to all of the posts I missed in the last week or so… Wishing I had seen this *before* Christmas morning! I might just have to give it a try one day next week. Hubs would love it. I to made this for Christmas morning, it was a HUGE hit. The leftovers this morning are just as delish! I added green peppers to the egg/cream mixture for some added color/flavor. This for sure will become part of our holiday tradition. Thanks so much for sharing such a special and delicious part of your holidays with others. My husband and daughter thank you as well! I made this for Christmas morning and it was such a big hit! I have been really hesitant about breakfast casseroles for some reason…unchartered territory, I suppose. But this one was fabulous. Everything blended together so beautifully and was terribly easy to put together. I loved that all I had to do was pop it in the oven and walk away for an hour. Thanks, again. EVERY single thing you post on this site is something I absolutely LOVE~! 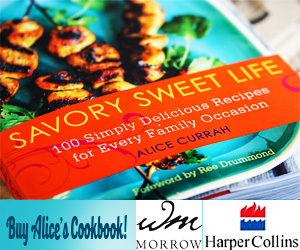 Thanks, Alice! Can you tell me how many this will serve? 6-8? This is the perfect casserole dish for a cold and snuggly morning. Perfect for my kiddies! 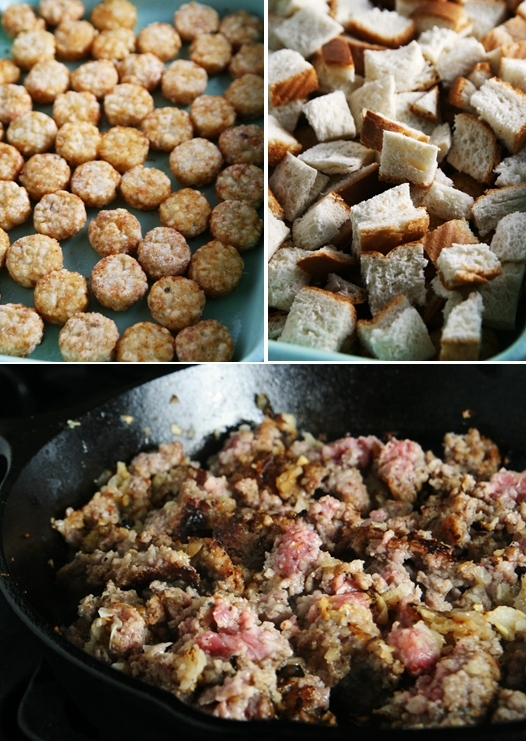 My 20’s-something nephew “informed” me last night that a “tater tot casserole” was at the top of his requested-food-list for this year’s Christmas morn; so, like all good aunties I googled all the ingredients that he could conjure up from his childhood memory… eventually leading me to your site! Your pictures are the clincher for me, in addition to the fact that Morning Star is now putting out a vegetarian “sausage”, making this recipe a real possibility for our new Christmas-memory-making opportunity 🙂 Thanks so much for sharing! 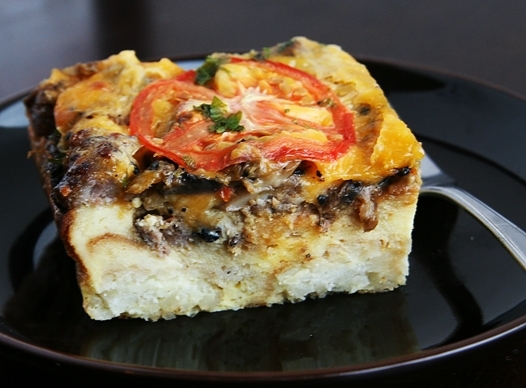 This is my favorite breakfast casserole!!! So yummy!! My family has made this breakfast casserole every Christmas morning since I can even remember! It is so delicious! Thanks for sharing. It sounds so yummy! 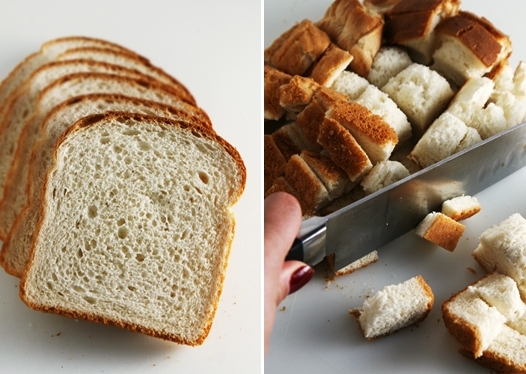 Thanks for sharing this recipe here. I can’t wait to taste it more so, I will make it at this upcoming Christmas. Thanks for these nice pictures too. Enjoyed your site so, I will keep visiting it very often. 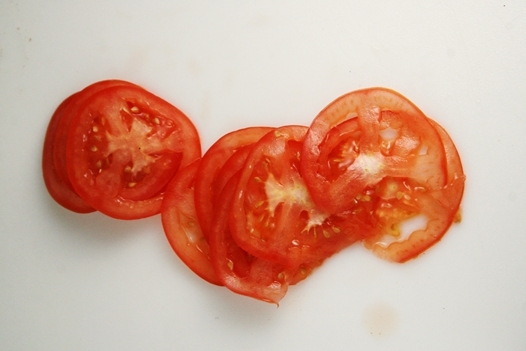 i am so hungry right now, this looks perfect. Cant wait for christmas breakfast for this kind of goodness! This is perfect for Christmas morning! Thanks. Now, where’s the recipe for the cinnamon rolls?! o.m.g. this looks fantastic! All that cheese just makes it irresistible! 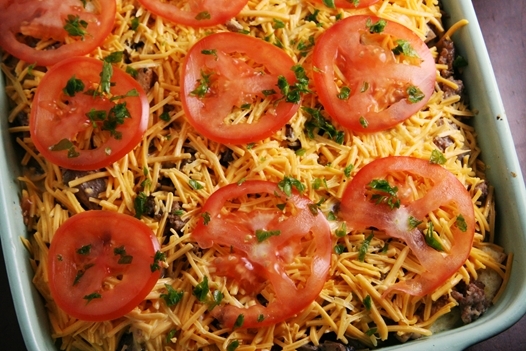 And the mushrooms and tomatoes – I have to make this for my parents in Seattle next week! darn! could’ve used this yesterday for my brunch! LOVE the tater tots!!!! Yum! I think I might have to try this one! Ooey, gooey goodness! This looks perfect for a winter morning. Yum. 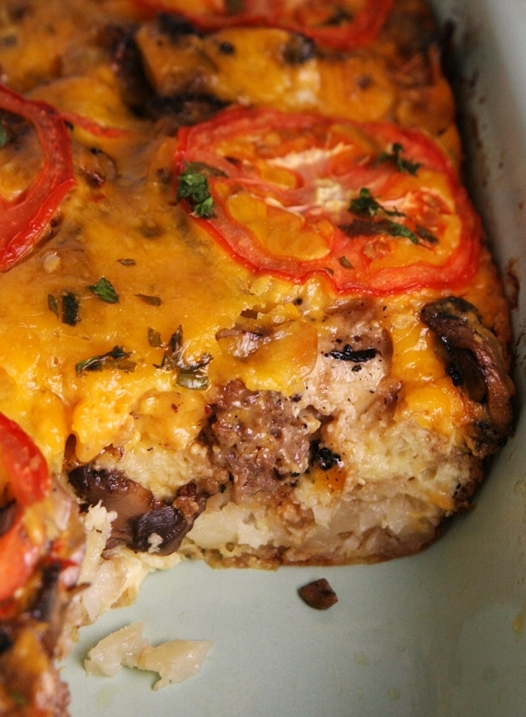 This looks like a nice upgrade on the normal breakfast casserole we do at Christmas. I’ll have to give it a spin. You do have leftovers right? Because I haven’t had breakfast yet. Really I haven’t. Yum!!! Yum! 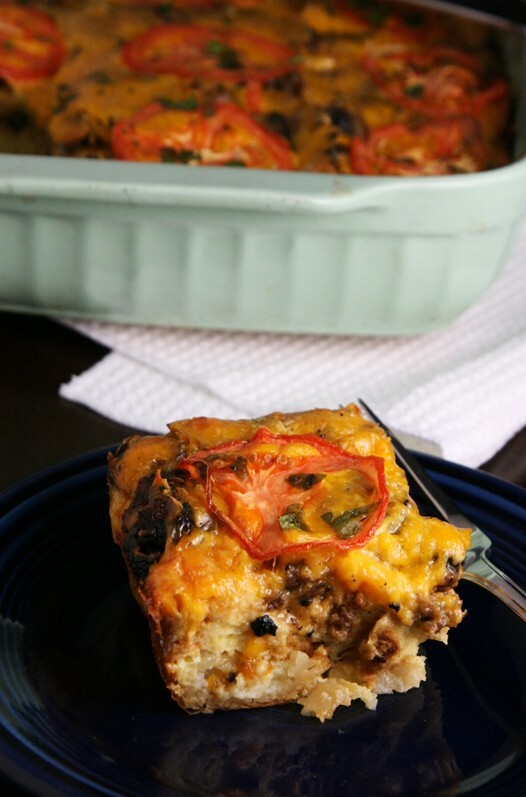 I’ve seen lots of recipes for breakfast casseroles similar to this but they almost always have a mexican theme with chilis in them. I would like that but not my extended family so I’ve never made one. I’m excited to try this out! Thanks.